Recently, several DOM faculty members have been recognized for their contributions to diabetes research. 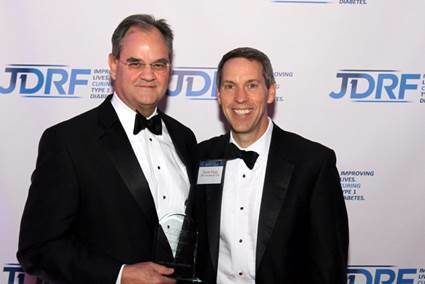 Landon King, professor in the Division of Pulmonary and executive vice dean for Johns Hopkins University School of Medicine, represented Johns Hopkins Medicine at the Juvenile Diabetes Research Foundation (JDRF) Greater Chesapeake and Potomac Chapter Hope Gala on Saturday, November 12. The gala raised over $950,000 for game-changing Type 1 Diabetes research. Rexford Ahima, professor, Nestoras Mathioudakis, assistant professor and Sherita Golden, professor, all from the Division of Endocrinology, were featured in the November Johns Hopkins Medicine monthly consumer health package discussing diabetes. Sherita was also featured in "Portraits of Humanitarians" in Odyssey Magazine from the University of Maryland for her work dedicated to diabetes.